Hello Katie Girl: What's Black and White... and Red All Over? What's Black and White... and Red All Over? It's me! This is my outfit for going out for a casual dinner with my husband's family last weekend. 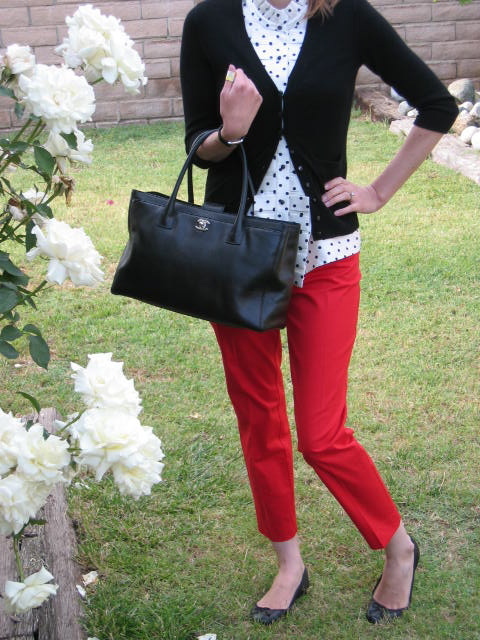 My outfit is comprised of: Black J.Crew cashmere cardigan, Kate Spade Abigail Must Love Dots Blouse, Gap Slim Cropped pants, J.Crew ballet flats, and Chanel Cerf Tote. 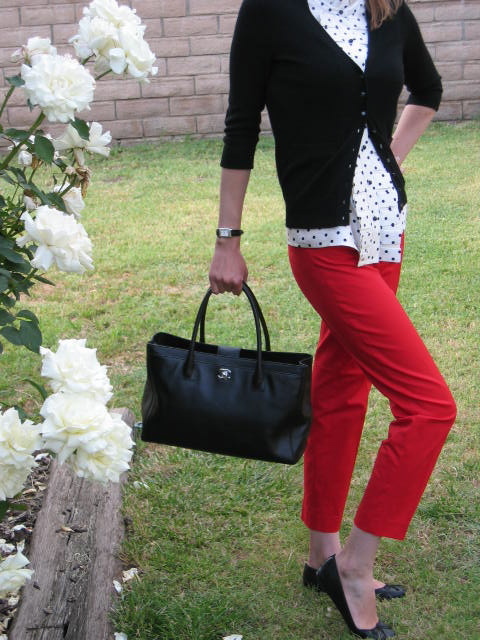 I noticed that many bloggers are commenting on the various incarnations of the "cropped" pant. I had my heart set on getting a pair in red and tried on several before purchasing the Gap slim cropped pant. Since I read various blog reviews about these pants, I thought I would offer a review of my own. Overall, these pants fit true to size, maybe a little big. I am wearing a size 2 in these pants. My normal size is a 2-4. They do seem to stretch a little bit after the first wear and given this I may have been able to size down to a 0. I also considered purchasing the J.Crew Minnie in a similar reddish orange color but the fit was not quite right and they also looked too much like leggings and not enough like pants for my taste. My Kate Spade Abigail blouse was truly a hit amongst all generations of my husband's family. It proved to be quite a conversation piece!